Soviet soldier in the liberated village. This soldier and his companions just arrived and liberated her village. She is greeting the Soviet Army. 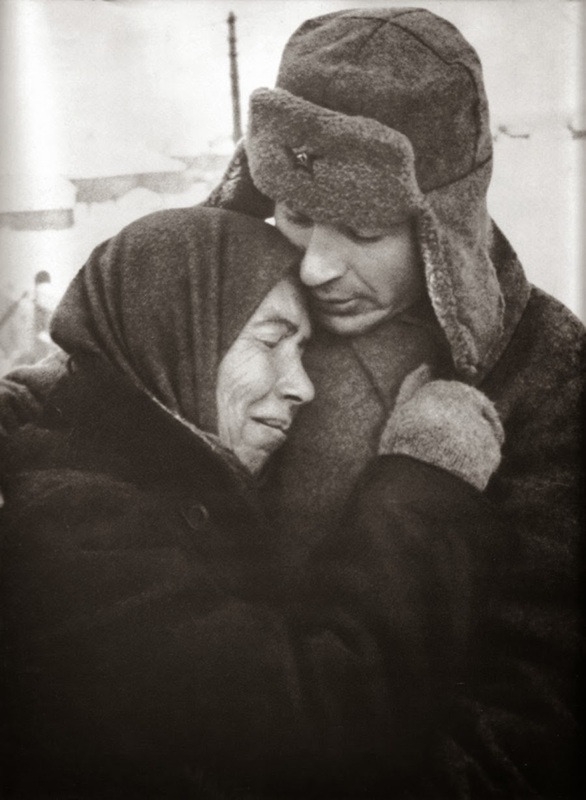 Photo taken after the Battle of Moscow, Soviet counteroffensive, December 1941. Original title: “In the liberated village“. Author: Ivan Shagin. By the start of December 1941, German soldiers had crossed the Moscow-Volga canal and forward units were just twelve miles from the Kremlin. But this was as close to the Soviet capital as the Wehrmacht would ever get. Because on December 5, 1941, the Red Army began a dramatic counter attack. Soviet units – many of which had arrived in Moscow only recently from Siberia – confronted German soldiers who had reached the limits of their own endurance. ‘The commanders used to say that the Siberian divisions saved Moscow”, said Vasily Borisov, one of the Red Army soldiers who had been transported from the East to fight in the battle for Moscow. “During the counter attacks there was man-to-man fighting. We had to fight the Germans in the trenches. And the fitter ones survived and the weaker ones died”. The German soldiers weren’t just exhausted – they were appallingly equipped for winter warfare. The Nazi leadership had believed the war would be won by the autumn of 1941, so why prepare German troops to fight in the winter? “When the temperature dropped to below minus 30 degrees Celsius our machine guns were not firing any more”, recalled Walter Schaefer-Kehnert, a German officer who fought at Moscow. “Our machine guns were precision instruments, but when the oil got thick they didn’t shoot properly any more – this really makes you afraid… We had huge losses from frozen toes and fingers during the night, and when the infantry had to sleep in the open, you tried to make a hole in the snow. Then there was an order that a guard had to go round every two hours and look, because you would freeze to death and you would not realize it was happening. Particularly if we had been fighting during the day and sweating and then we cooled off at night – that was when the greatest danger was of freezing to death. It’s a very nice death but you don’t want to have it!”.